Green Star Solutions offers a sustainable solution to electric transportation as an Authorized Representative for Coloumb Technologies EVSE (Electric Vehicle Supply Equipment). Coloumb Technologies is a leading vendor with an extensive and successful portfolio. A trained integrator will perform the installations supervised by a Master Electrician. Plug-in Electric Vehicles (PEVs) offer improved fuel economy and lower emissions. In addition, they have strong acceleration with quiet operation. Although, PEVs do require the infrastructure to support them. Green Star Solutions will provide an electric vehicle charger targeted to your needs whether you are company with a fleet of vehicles or are just plugging-in at home. 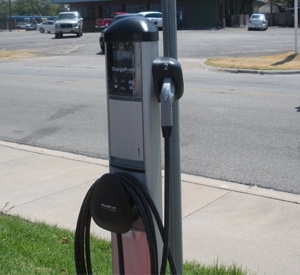 Electric Vehicle Charging Stations supply power where needed. Whether it be street-side, garage or parking lot, or residential, we can find a solution for you. As well, we can provide the car’s onboard charger with the electricity it needs to refill the battery. With the increasing volume of PEVs on the road in the near future, there is an incentive to installing charging stations. Your customers will appreciate the convenience of having their vehicle charging while shopping. And the cost of electricity can be offset with a Solar PV Array.